The time shift has not quite set in for us as we leave for dinner at 8:00 PM, following a frantic 30 minutes trying to rebook a flight to Florence tomorrow after ours was cancelled. For us, not a crisis, an inconvenience. Another charge to the credit card. Yes, I am aware we are lucky. What would be di if we could not jut “fix” this situation? I am paying attention. 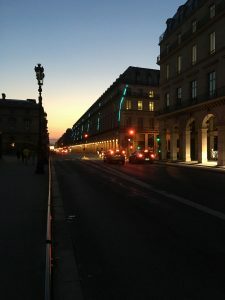 We walk away from our apartment, back towards Rue de Rivoli, expecting to see many of the PRIDE festivities continuing, and we were not disappointed. Large groups of people in the parks, dancing in the streets, ongoing festival air and song float throughout the streets. We sit to eat, finally settling on pizza and wine, and I again get to marvel in the intelligence and thoughtful way that my child engages in conversation. Forming relationships with adult children is a different experience, and engaging this way is both a gift and a revelation that we are both getting older. Life has not been easy for the last 6 years in our world, and we walk through our experiences, and hopes for the future. Some feel limiting, others feel limitless. Trauma of a critically injured parent, college, and the mama being diagnosed with breast cancer have certainly shaped this child of mine in many ways. I own quite a bit of guilt for her jumping in as a parent for her younger brother as I spent weeks at the hospital with Frank, and then again as an adult needing to relive distress as I braced her for my cancer journey. If you asked her, she would tell me I am being silly, and it is all part of who we are as people. Our experiences make us who we are – smart kid that one. 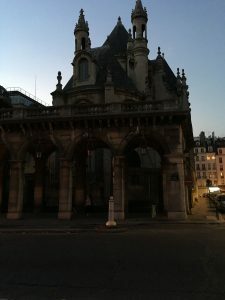 We join the smaller group of people wandering their way through the streets of Paris, stopping at the carnival for ice cream, taking video of the rides for the brothers, and finally, a view of the Eiffel Tower. 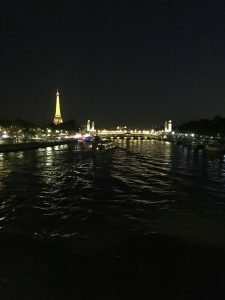 We spend time by the water, watching the boats sail by loaded with others out at night, and take the photos required when one is in another country at a landmark. Our walk back is greeted with closed shops, more darkness and laughter that McDonalds appears to be a staple across the world even at 1:00 AM. Feeling both energized and sleepy, we arrive to the beautiful blue doors marking the entrance to our apartment, and take the tiny elevator to our entrance. I am ready to settle in, and Mariah is ready to visit a bit more of Paris. She heads out to the corner café to paint and watch people, while I settle in, laughing at myself for not staying awake past 9:00 PM at home, and just now settling in at 1:30 AM. Time is relative across the world from your bodies normal sleep cycle – I feel that it will be an interesting night of trying to pretend to sleep from all of the excitement of the day.